Former FIM European Superstock 600 Champion Jed Metcher says that he is all too excited to be reunited with the Australian team for the upcoming 2019 International Island Classic. The 28-year-old Victorian rider, who has a total of 12 race starts in the International Challenge told Bikesportnews.com that he was very thankful to the Australian team captain, Rex Wolfenden, for getting him back on board again for 2019. “It’s great to be back on the team again,” said Metcher. “What makes it even better is that fact, not only am I teaming up with a strong team this year, I’m back on the T-Rex Honda Harris, prepared immaculately by Rex, John ‘Buck’ Rogers and Paul Walkley. With the testing we have done on the bike thus far, I believe we have a really strong package to fight for top threes, if not race wins,” declared Metcher, who was equal on points with Jeremy McWilliams in 2016 for the Ken Wootton Perpetual Trophy. 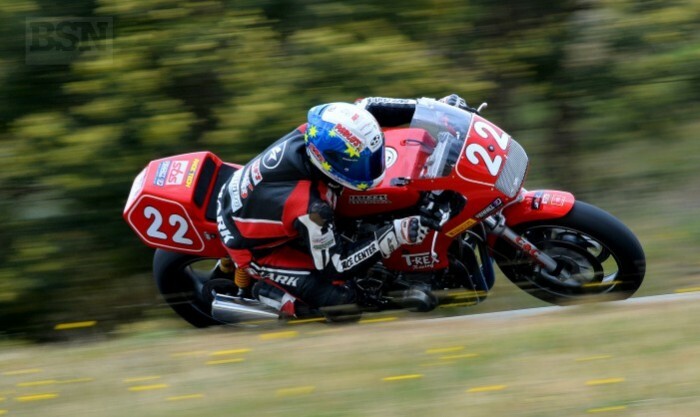 Metcher and Wolfenden have been working hard on bike setup for the Island Classic since last year’s Historic Road Racing Championship in November at Broadford State Motorcycle Sports Complex, which saw Metcher winning the Australian Period 5 Championship. Metcher has also added his excitement about the prospect of racing against the likes of USA’s Jason Pridmore, four times AMA Superbike Champion, Josh Hayes and triple BSB champion, John Reynolds who has been drafted into the New Zealand squad for 2019. “To be able to line up on the grid and race against the likes of Josh, Jason, John and the other top notch Aussies will no doubt be entertaining. While the UK team might not be heading out, race fans will still be in for one heck of a show as there are some big names taking to the grid this year, who are all capable of winning,” expressed Metcher, who has seven top three finishes from twelve starts, which include three race wins. While Metcher is aiming to win the prestigious Ken Wootton Perpetual Trophy, focus will be on team points. “As much as I want to go out there and win all four races across the weekend, I know the rest of the Aussie team and I have to be thinking of the bigger picture, which is the team points for the International Challenge. We (the team) have to ride smart and use our heads and make sure we finish as best as we can and score as many points as possible. I would love nothing better than to be part of the team and to be able to win the challenge again for another year,” finished Metcher. The 2019 International Island Classic gets underway on the 25th of January with two eight minute qualifying sessions scheduled before lights go out on Saturday for race action.